Showing results for tags 'poni'. This is the first of many others to come. I made this in 2007. I accidentally added Papuwa and Pani Poni Dash, but they are licenced by Square-Enix as well. I also added Elfen Lied's Lucy on the pic just for the heck of it, she really was a sad character that deserved a happy ending. 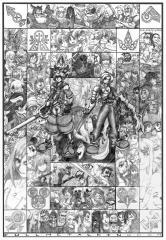 As you can see, many characters, including heroes and villains from Kingdom Hearts, Fullmetal Alchemist, Disney and Final Fantasy, are on this picture. I hope you all love it.